Picking out the artwork for your child’s room is an important task. It adds that special something to the room and can provide the finishing touch that pulls all the elements of the room together. Urban Tickle is here to help! They are offering Project Nursery readers a chance to win a $100 gift certificate to decorate your child’s room with their beautiful art prints. From owls and robots to maps and quotes, you’ll find just the right combination of cute and modern in these prints. I’ve got my eye on the brothers robot print—so adorable! Urban Tickle’s artwork can be customized with color, names and sizes. Be sure to check out the rest of Urban Tickle’s collection of artwork, decals and more in their shop. WIN IT! One Project Nursery reader will win a $100 gift certificate to Urban Tickle (certificate can be used for paper prints only). HOW TO ENTER: Visit Urban Tickle, and leave a comment below letting us know which print is your favorite. Contest ends Friday, September 7, 2012 at 11:59 PDT. Winner chosen by random number generator. 1. “Like” Project Nursery and Urban Tickle on Facebook, give us a shout out on our wall and tell us you did with a comment below. 2. Follow Project Nursery and Urban Tickle on Twitter, tweet about it and tell us you did with a comment below. 3. Follow Project Nursery and “pin” Urban Tickle images from this post on Pinterest and add your Pinterest link in a comment below. I’m totally loving the Modern Nursery Art Prints – Set of 3- Linguistic Friends. The “bonjour” racoon is so cute! This would go great in our nursery. I love these prints! It is so hard to choose a favorite! 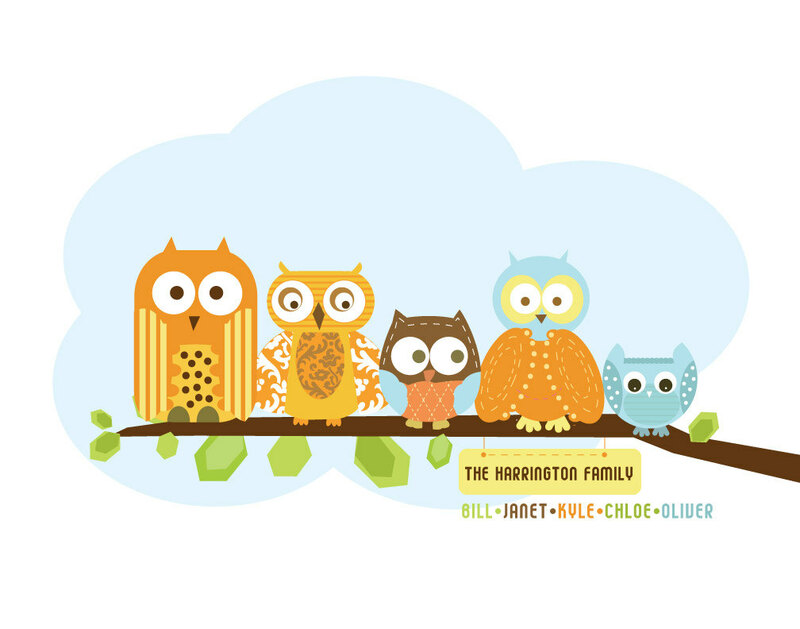 I am really digging the Nursery Birth Announcement print with the owls. I “liked” project nursery and urban tickle on facebook! And I told my friends about this great contest! i love the transportation alphabet and number set. they are the exact colors of my little guys room and we are using cars, planes, trucks, etc. so it’s perfect! i pinned about this contest! I love all the owl prints! I don’t think I can choose just one…. I love the “Be the Change You Want to See in The World” print. I would hang it in my little girl’s room. Love the Set of 4 Twinkle Twinkle Prints. Goes perfect in her nursery! liked on Facebook, get the newsletter as well as pinned a picture on Pinterest. Liked both & commented on fb pages. Following both on twitter & tweeted giveaway. Following on pinterest & pinned. Love the growth charts and Tree Decals! Love the flower art for girls! Also a fan of both on Facebook! these are all super cute. The robots for girls are adorable. We have an ocean theme, and it is hard to find artwork with sea animals that fits our decor. They have educational facts about the critters too, which is very cool! I love the Modern Nursery Art prints (set of 3 linguistic friends) from the Etsy website. I love, LOVE the World Map Decal – Adorable! Thanks so much for the chance! I was on the Urban Tickle website for 1/2 hour and I cannot decide. My sons Hayden and Henry will soon share a room. Hayden is two and loves Robots and outer space so many of the adorable collections would be admired. I like the the map or the trees decals myself, but I’d probably let Hayden choose! I would adore it if I could customize with thier names! I love the sleepy owl on a tree print! I gave a shout out on Project Nursery & on Urban Tickle’s FB pages! My favorite is the owl family! I like the ABC Deep Blue Sea art. I love the deep blue sea set of 4 prints. I love the baby shower poster, Elephant Showers Poster! I like the robot trio. I love the Superhero Art Print! golden slumbers is really cute! I like the Vroom Vroom boy art series. I am a weekly subscriber. My favorite is: Modern Birth Announcement, Elephant and Baby under a Tree. Just lovely. I love the modern city art prints! I like the world map art! Very cute and educational! Loooove the owl print you showcased above. Too cute. I’m a subscriber to your weekly email too! I like the urban tickle personalized growth charts! I love the ABC and 123 wall prints! I follow both pages on twitter and tweeted!!! I like the fabric wall decals with initials. I really like the Growth Chart Height Chart on Canvas- Seaworld- 13″ X42″ Inches. I’m an email subscriber and like you on facebook! Oh dear, so many choices! I like the “Oh the Places you may go!” Prints. Just tweeted about the contest from MamaMelanieSD! There are so many to choose from. I love the owl prints with wakey wakey and night night on them. So cute! Already a subscriber to the newsletter and love it! I love love love the World Map art! Love the Car Decal for Kids, Rush Rush Traffic large, Transportation, Car, Bus, Road, Buildings, Playroom decor! Um I may now be slightly obsessed with this site!! I am totally in love with the birth announcements! What a cool way to display my childrens birth stats… Also love the brothers robots image above my two boys are inseparable and this depicts that perfectly. I am equally in love with the “dare to be you” image. That is my hearts desire for them.. that they feel the power and beauty in being who God intended them to be. Liked Both FB pages ! I Love the brothers forever robots! Too cute my boys would love it. The planets are so cute! I love the twinkle twinkle little star prints. They go perfectly in my little guy’s nursery! Would love the enchanted forestscape. Liked both on facebook and gave shout outs on both walls. Followed both on twitter and tweeted about the giveaway. lready a member.Love the you are my sunshine wall decal and the elephant baby shower poster. I like the personalized Name for Child’s room 11×14. Love the grey and orange combo in the modern nursery art prints! I really like the live, love, laugh flowers! I like the maps! So cute! I love their ABC print! I like the “LOVE” owl print! I love the ABC 123 wall prints! Love the “You are Loved” print!! I liked Urban Tickle on Facebook! I am a subscriber to your weekly newsletter! I would pick the modern city art prints. Simple, adorable and the perfect colors for the crib set I love. I liked Urban Tickle on fb. They have so much cute stuff! I. Love the enchanted forestscape decal & family tree print! The “You are loved” personalized print is my favorite! I love the owl family. So cute! I also have subscribed to the Project Nursery newsletter! I love them all but have my eye on the customized name prints. I already subscribe to the newsletter! Love the Modern nursery art prints as well as the ‘You are Loved’ artwork on this page. Since this is my first child and I am not sure what I am having yet, I prefer gender neutral items. I love the world map series! I liked Urban Tickle and Project nursery on Facebook! I also subscribed to your newsletter! I love the tree wall decals! I like the Enchanted ForestScape. I love the owl growth chart! I Lie Project Nursery and Urban Tickle on Facebook and gave shout outs! Love you both on FB! Following you on pinterest, and pinned! The map prints are pretty fun. I love the Modern Prints Bicycle Tracks! love the scooter growth charts!! love the elephant with hearts baby shower print! Love the owl growth chart & the modern art owl print! I’m totally in LOVE with the Modern Art – Nature Dwelling picture set AND the ABC/123 Wall Prints!!! I love the flower tree decal! I love the owl prints with the words to Twinkle Twinkle Little Star…since that is what I sing to my triplets every night. I “like” both of you on facebook. I like the growth charts…I would love one! I love the Planets Print, so cute! I follow both PN and Urban Tickle on Facebook! I liked on FB and follow on Twitter. Love all the art work! I Liked Project Nursery and Urban Tickle on Facebook.